There is a War Memorial for both world wars in the graveyard to the west of the priory, and a Roll of Honour for the First World War in the church. 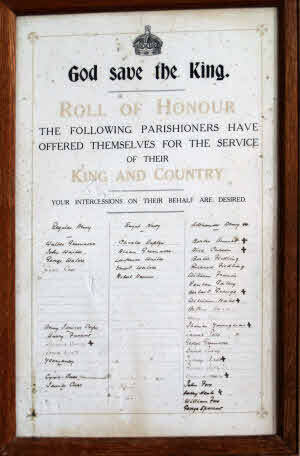 The Roll of Honour in the church contains the names of all those who fought in the First World War, and those who died have a cross placed by their name. CLARKE Wallace Edward Corporal TS/1323. Army Service Corps. Died Tuesday 19 December 1916. Age 34. Born Binham. Lived Framingham. Enlisted Woolwich. Son of John Clarke, husband of Rose Ethel Pettitt (formerly Clarke), of Arminghal, Norwich. Born at Binham. 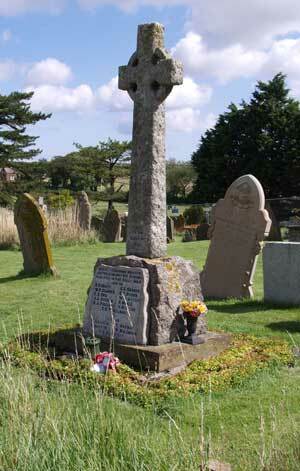 Buried: FRAMINGHAM PIGOT (ST. ANDREW) CHURCHYARD, Norfolk, United Kingdom. COE E E Private 10390. 2nd Battalion Yorkshire Regiment died 25 August 1915 and buried in BULLY-GRENAY COMMUNAL CEMETERY, BRITISH EXTENSION Ref. IX. B. 6. CURSON Alec George Private 13666. 8th Bn., Norfolk Regiment. Killed in action Wednesday 19 July 1916. Age 20. Born Binham. Enlisted Norwich. Son of George and Leonora Curson, of Westgate, Binham, Wighton, Norfolk. Commemorated: THIEPVAL MEMORIAL, Somme, France. Pier and Face 1 C and 1 D.
FICKLING, MM Bertie John Serjeant 43966. 10th Bn., Essex Regiment. Formerly 12911 Norfolk Regiment. Killed in action Thursday 8 August 1918. Born and Lived Binham. Enlisted Norwich Buried: BEACON CEMETERY, SAILLY-LAURETTE, Somme, France. Ref. V. B. 9. GRANGE Herbert George Private 13293. 8th Bn., Norfolk Regiment. Killed in action Wednesday 19 July 1916. Age 20. Born and lived Binham. Enlisted Norwich. Son of John Suggett Grange, and Maria Grange, of Binham, Wighton, Norfolk. Commemorated: THIEPVAL MEMORIAL, Somme, France. Pier and Face 1 C and 1 D.
MALES William Henry Private 12940. 8th Bn. Norfolk Regiment. Died 1 July 1916. Aged 21. Born at Bethnal Green, London. Son of Henry Joseph and Sarah Elizabeth Males of 120 Oakdale Rd, Leytonstone, London. Buried DIVE COPSE BRITISH CEMETERY, SAILLY-LE-SEC Ref. II. A. 3. NEALE Harry Robins Private 19676. 7th Bn., Norfolk Regiment. Killed in action Sunday 18 March 1917. Born Binham. Enlisted Norwich. Buried: FAUBOURG D'AMIENS CEMETERY, ARRAS, Pas de Calais, France. Ref. II. H. 20. WYER Henry H Private 13284. 1st Bn., Norfolk Regiment. Died of wounds Tuesday 3 September 1918. Born Binham. Enlisted Norwich. Buried: EUSTON ROAD CEMETERY, COLINCAMPS, Somme, France. Ref. II. G. 2. YOUNGMAN, MM Thomas S C Serjeant 13669. "B" Coy. 8th Bn., Norfolk Regiment. Killed in action Tuesday 31 October 1916. Age 19. Born North Lopham. Enlisted Norwich. Son of Hannah Elizabeth Youngman, of the Alms Houses, Binham, Wighton, Norfolk, and the late George Youngman. Commemorated: THIEPVAL MEMORIAL, Somme, France. Pier and Face 1 C and 1 D.
BAXTER H No further information available at present. DAPLIN Frederick William or Daplyn. Sergeant 1396428 (W.Op./Air Gnr.) Royal Airforce Volunteer Reserve. 433 (RCAF) Sqdn. Killed 20 February 1944, aged 21. Son of William Charles and Florence May Daplyn, of Cockthorpe, Norfolk. Buried BERLIN 1939-1945 CEMETERY. Ref 6. J. 16. KENDLE C Possibly: Cecil Robert Kendle. Corporal 5775158. 5th Bn., Royal Norfolk Regiment. Died Saturday 14 February 1942. Age 22. Son of Mr. and Mrs. H. Kendle, of Thetford. Norfolk. Commemorated: SINGAPORE MEMORIAL, Singapore Column 48. MANNING Reginald John Gunner 786647. 5 Regt., Royal Horse Artillery. Died Monday 27 May 1940. Age 33. Buried: LONGUENESSE (ST. OMER) SOUVENIR CEMETERY, Pas de Calais, France. Ref. Plot 9. Row A. Grave 20. There is a separate stone engraved as follows: 786647 Gunner R J MANNING. K. BATTERY R.H.A. BATTERY H.Q. DEFENCE OF VILLAGE HONDEGHEM. Withdrawal from DUNKIRK 44 DEAD. F TROOP. RIVETT Francis Edgar Arthur Sergeant 1804254. Air Gnr. 576 Sqdn., Royal Air Force Volunteer Reserve. Died Friday 24 December 1943. Age 19. Son of Arthur Henry and Isabella Rosalind Mary Rivett, of Thetford, Norfolk. Buried: HANOVER WAR CEMETERY, Hannover, Niedersachsen, Germany. Ref. 3. H. 19.